Hope you are all well and happy. I have just got back from another weekend in a field and am busy today sorting, washing (and drying!) bits of kit and tents. 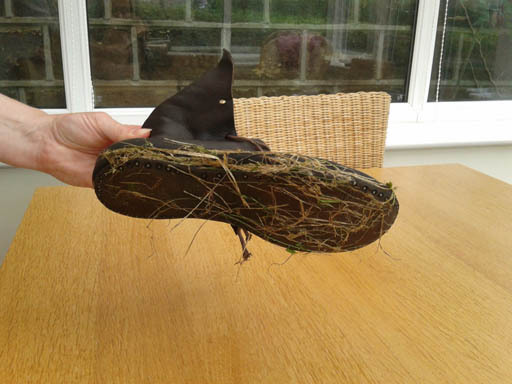 We have had a lovely time at the Midlands Living History Festival and as befits a British summer managed to get sunburnt and soaked in the same weekend!Here is a picture of one very soaked and grass-covered medieval boot, off to dry out. Generally though the weather was very good and we had two BBQs and bacon butties for breakfast in the sun both days – I love camping! We are nearly at the end of the re-enactment season with only 2 more events to go which makes me very sad. I am seriously considering joining another group as well so I can have more fun in a field next year. I may do a different period so I can do some other types of embroidery! 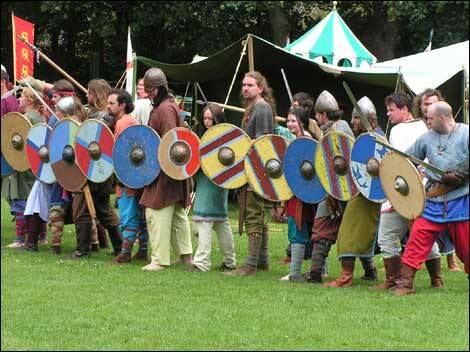 This event was multi period so we got to watch a brilliant dark age battle on both days with lots of Vikings and Saxons from groups such as Vikings of Middle England. The battle was very good – scary to watch as they fight with no helmets and very little armour unlike our medieval guys. The pic below shows them at an earlier event and is one I ‘borrowed’ from the BBC website. Unfortunately I have managed to break my camera (I am lethal with cameras!) and my spare one would not work either so I have no other pics to show you. It will have to be taken to the menders this week as I am lost without it. I have got a couple more from last weekend – taken by my lovely friend Wendy who was being our official photographer for the weekend. 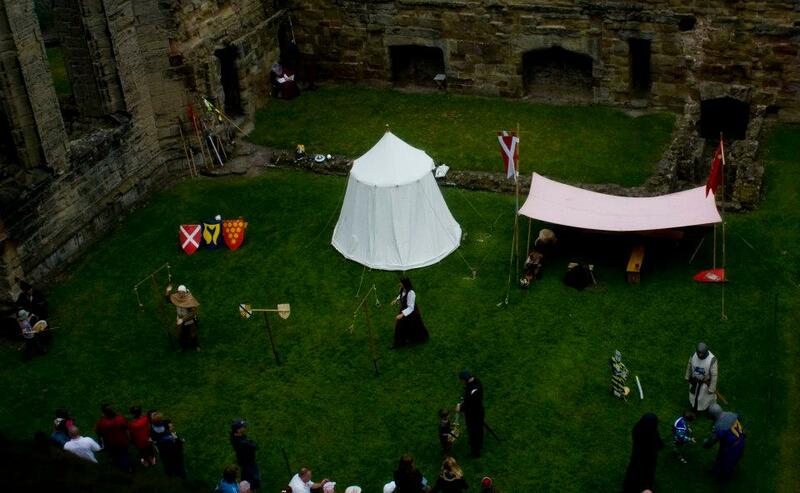 This one was taken from the top of Ashby Castle tower and shows the camp with our activities. I am bottom right helping with the knighting of the kids after their sword training. This is a brilliant shot of the tournament on the Sunday with me in my nun’s costume on the left.The boys’ armour and costumes look great – even in the rain! I have got a quiet couple of weeks work wise and a weekend at home now so am going to be doing lots of sewing. Have just made my lovely friend Kerry a chaperon (but forgot to take a picture of it before the camera broke) and have just sent off my Summer Exchange piece so will upload pics of that when it has been delivered. Still working on a stitched baby gift and might just get around to making that new peasant dress that I have been promising myself for the last few years. I have also treated myself to some Blackbird Designs patterns after seeing so many lovely ones on the Seasonal Exchange blog so am waiting for those to arrive. The one compensation about Autumn and Winter is lots of time to stitch as I seem to have done so little just recently. Also I am really looking forward to the start of the new term as I will be going to China with work again twice before Christmas – how exciting! Take care and have a relaxing week whatever you are doing. Thanks for visiting and see you soon.